250LONDON products are very much born in fashion and steeped in dirt bike style, as recently recognised by British Vogue Magazine. As a design-led brand, our inspiration comes from many places and eras, mixing practical expertise, in design and manufacturing, with authentic experience and passion for offroad culture, be it Motocross, Enduro, Flat Track, Green Laning, MTB or Downhill. Furthermore, it fits with the trend of fashion sportswear and the mash up between Motocross and Street Style, gaining it approval with fashion conscious bikers and hipsters alike. It’s always a pleasure to reveal our new collections and we’re stoked to launch our 2019 range of MOTO JERSEYS. We’ve a bunch of brand new designs and a few remixes of old favourites, with some fresh new colour ways thrown in for good measure. All made from super lightweight, 130gsm, silky soft Polyester, some in breezy and breathable Airtex fabric. The new styles are priced at a fair £49 and all are designed to complement our 250 MOTO PANTS. We’re also peppering the range with new Tees, American style Truckers and Coach Jackets, soon to be revealed. As always, and because we can, we’ll introduce new designs across the season to keep the collection fresh. For Press Call ins, email Jen on press@250london.com and scroll to the end for a DROP BOX link to the high res Product Shots/Cut-Outs. Brand new for 2019 and incorporating all our favourite colours, the PIXEL pops with style and the Airtex fabric will guarantee you a breezy ride on a hot day. Sophisticated Sister to the TOMCAT and oozing gravitas, the SNOWCAT is a luxurious Moto Jersey, made from lightweight and truly lush 130gsm silky jersey. Whether you ride MX, Flat Track or MTB, you’ll be cool for cats in this jersey. Our spin on the old-style classic checker board and gushing with dirt bike style, CHECKER comes in 2 colour-ways. Made in a super-lightweight, 130gsm fabric, ideal for MX, Flat Track or MTB. 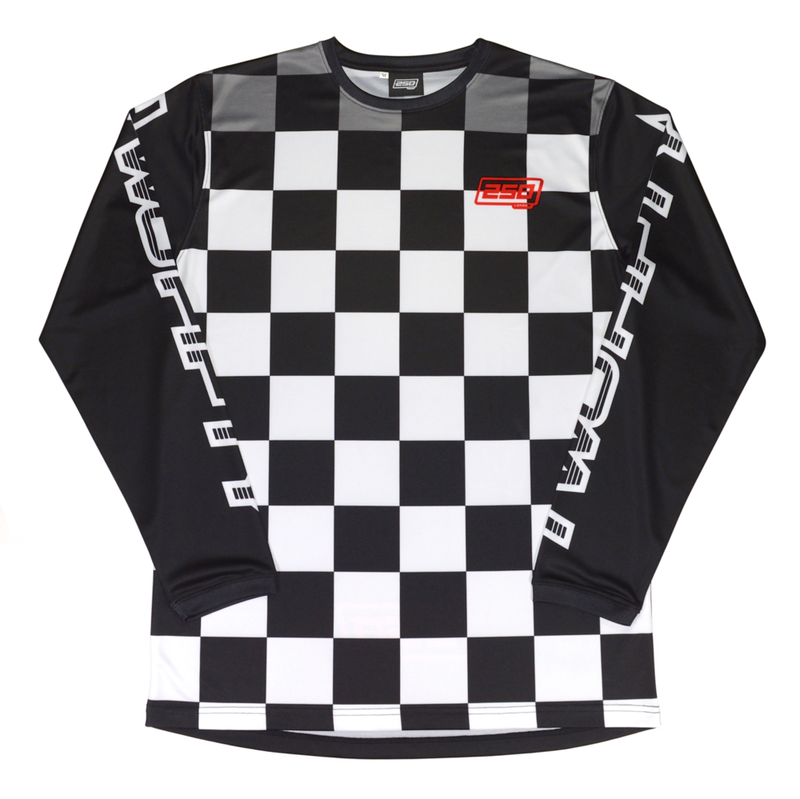 We can’t have a Moto Jersey Collection without go-fast stripes, can we? So here you go, STRIPES is bold and new for 2019 and comes in 3 colour-ways. Furthermore, we’re carrying over our most popular designs to date, below, Tomcat, Tropical and Stars + Stripes. That’s it for now folks. Keep your eyes peeled for more designs coming soon. To the get the scoop, sign up to our PRESS LIST.